I have been planning a International Giveaway from a long time but wasn't sure when should I announce it. :P At-last I thought if I am going to do it, then why not now! :D Thanks each and everyone for showering so much love on my blog and on a newbie blogger. :k ^_^ Enough of my blabbering, lets go the details of the GIVEAWAY. The Giveaway runs from TODAY to 31st December (12pm IST). I will announce the winners on 1st Jan 2014. Giveaway is open to everyone (international <3 ). The first 3 Winners will be picked by using Random.org and the remaining 2 Winners with Maximum Entries and the winners will be announced on Facebook & Twitter. I will also email you on the address you use to enter this Giveaway. You MUST use the widget below else your entry wont be considered. My favorite beauty product is MAC Ruby Woo Lipstick. Thanks for such a lovely giveaway.. These days I am in love with the Maybelline Clear Glow Bb cream..
Hmmmm, mine is Luview Mineral compact base.. Thanks for the giveaway.My fave is EOS! My fav beauty product is BIG & BEAUTIFUL BOOM! Volume Mascara - ASTOR. Sleek blush by 3 in lace is my favorite beauty product. My recent fav beauty product is very me lipmania vibrant peach lipstick.. Very nice giveaway...hope to win.. Thank u so much for wonderful giveaway again:-) entered..
My favourite beauty product these days is Lakme CC cream as it effortlessly blends n gives me natural glow all day long :-) n I love ingot n mac my super favourite brands.. Fantastic Giveaway! Great idea and something I need to look into doing! My favorite beauty product is maybelline colossal kajal pencil, cheap and best kohl ever! Can you believe I am on my 22nd stick. :) :) :) :) ;) That much I love it! i like Dior products.......especially the lip glosses!!! Great giveaway! !My fav. Is mac "pink nouveau" lipstick! My fav beauty product is Seventeen The Stylist! Thank you! Entered everything except instagram, hoping to win the giveaway. Btw your blog looks so cute and girly and unique. I love MAC and oriflame, their all products..
Look alot prettier .... Have a MAKE-UP kinda day. 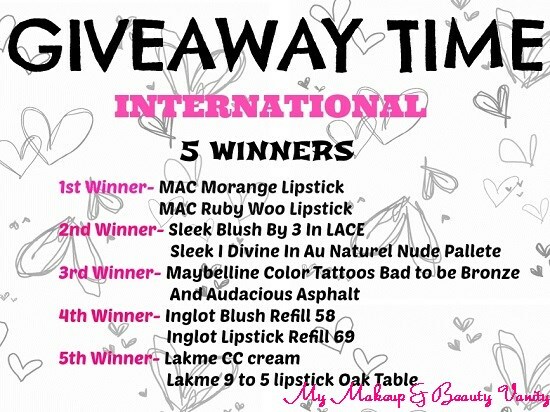 awesome giveaway...i want to win Riri woo lipstick..
ΕΚΑΝΑ ΟΛΑ ΤΑ ΒΗΜΑΤΑ !!!! ΜΑΚΑΡΙ ΝΑ ΦΑΝΩ ΤΥΧΕΡΗ !!!!! ΚΑΤΑΠΛΗΚΤΙΚΑ ΟΛΑ !!!! my fav product is garnier bb!!!!! Thanks so much for sharing! What a great giveaway! Stop in from ubc haven't had much of chance to be on the net but hope your having a good day. My Favourite Product is the ELF Mineral Foundation & Inglot blush 58. Thank you for this lovely giveaway!! !My current favourite beauty product is The Body Shop Born Lippy lip balm!!!! Ohhh love mac! !thank you for the great giveaway Riya!!! My fav product is Dior addict lipstick!!!!!! My favourite beauty product is Boujois Healthy Mix Serum Foundation! It is very moisturising and it smells greaaat! Nice Giveaway :) .. My fav beauty product is a concealer ..
i love mac! all products! I'm in love with UD Naked basics palette! my fevourite beauty product is colorbar velvette matte lipstics. I love Dior's lipstick "rouge au serum"
Currently my favorite product is Nars Radiant Creamy Concealer in Honey. I trully love it! It's color is very soft and flattering and makes a great job! best beauty product is hourglass primer! OMG...this is just what I was drooling over for long,,,MAC lipsticks!!! My favourite is MAC Ruby Woo lipstick & also Laura Mercier Candlelight shimmer powder ...Attractive giveaway !! Lovely giveway ! Wish to win and be the luckiest ! My favorite beauty product is Cargo blush! l'oreal is my best beauty product !! awesome giveaway! my fav products are all maybeline mascaras! Thanks for the wonderful giveaway. My favourite beauty product has to be Chanel Vitalumiere Foundation. Thanks for the beautiful giveaway !!! Yay!! I am so excited for this giveaway. I am having one on my blog too. My favorite beauty product would be BB creams. They have definitely reduced all the effort hat we need to put in for looking good. My own favorite is the ponds one. thank u so much 4 this awesome giveaway . Thanks Riya Ghosh for wonderful contest. Keep it up. I love Mac Morange lipstick. I wish You Happy Holidays and Happy new Year! It gives me a perfect skin!